White Inhabitants in the area of what would become Alabama date back to explorers from Spain in the early 1500s. Over the years, Spain, France and England have laid claim to portions of the land. With the beginning of 1700s, French settlers were established near present-day Mobile. From the mid-1700s to 1800 with various wars among the Europeans, the land changed hands to the Spanish and then to the British. Various squatters were moving onto the lands which had once belonged to the native Indians. The tribes of Choctaw, Chickasaw and Cherokee had to relocate. The State of Alabama was original part of the territory of Mississippi and then Georgia. In 1802 the western portion of Georgia was ceded to Alabama. Many long-time families of Alabama actually have ties to Georgia. New white settlements were established in the former Choctaw, northern Chickasaw and Cherokee Indian lands. The Spanish West Florida lands along the Gulf of Mexico coast was ceded to the United States by Spain. During 1812 and 1814 were the Creek Indian Wars. By August 1814, the Creek Indian lands had been ceded to the United States. Alabama become an official U. S. territory by 1817 with its capital at St. Stephens. On December 14, 1819, Alabama joined the United States as the 22nd state. Between 1805 and 1835, many people from the original thirteen coastal states moved onto the former Indian lands. In 1826, the state capital was moved to Tuscaloosa. By 1830 with a population around 309,000; approximately 3,200 lived in cities and the remainder, 306,000 lived in rural area. The white population was approximately 190,000, with the African-Americans (free and slaves) numbering 119,000. A cotton gin factory was established in Montgomery. In mid-1830s, gold was discovered in the eastern-central hill region of Alabama bring more people to the area. In 1837 was the Second Creek War, which was won by the United States military. By 1840 most of the Indian tribes have been moved west of the Mississippi River. In 1847 a new capital was established in Montgomery. By 1850 the population of Alabama had grown to 771,000 people; with whites numbering 456,000, African-Americans (free and slaves) numbering 345,000. 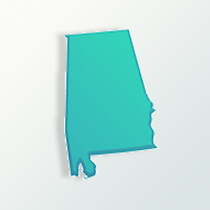 Approximately 737,000 people of Alabama were rural residents. On January 11, 1861 Alabama seceded from the Union. From February to May, 1861, the city of Montgomery was the Confederate capital, then the capital was moved to Richmond, Virginia. During the Civil War nearly 200 military battles occurred within Alabama. In June 1868, Alabama re-entered the Union and grants black suffrage to its African-American population. In understanding Alabama genealogy, see by 1870 the population was 990,000 people, nearly half were African-American. More people from other regions outside Alabama were coming into the state over the next ten years with Birmingham developing iron and steel factories. Yet, the older, established white populations of Alabama, roughly 12 percent had migrated to Texas and other sections of the country. The population in 1880 was 1,262,000. By 1900, the population of Alabama was 1,829,000 with 827,000 being African-Americans. Alabama’s industrial and commerce base continued to grow into the 20th century. The shipbuilding industry out of Mobile grew. With the growth of industry and less agriculture by mid-20th century, some people did move to other states. This is important to note in Alabama genealogy. Racial conflict erupted during the 1950s and 1960s. With the U.S. Voting Rights Act in August 1965, African-Americans in Alabama began to participated in more government, civic and business activities.